First he studied medicine in Vienna, then vocal at the Vienna Music Academy. He was a pupil of Tino Pattiera and Paul Neuhaus. He made his debut in 1936 at the Landestheater in Linz (Danube) as Hans in B. Smetana's ‘’The Bartered Bride’’. In the 1937-1939 seasons worked at the Stadttheater in Basel and St. Gallen, then, until 1941, he appeared as an operetta singer at the Mellini-Theater in Hannover. During the World War II he sang at the Theater of Nollendorfplatz in Berlin in operetta roles (among other things as Danilo in ‘’Lustigen Witwe’’ and Barinkay in ‘’Zigeunerbaron’’). In 1943 he was engaged by the Städtische Oper (Deutsche Oper) in Berlin, where he made his debut as Nando in ‘’Tiefland’’ of E. d'Albert. He remained connected to this opera house throughout his career. In 1948 he appeared there in the world premiere of the opera ‘’Circe’’ by Werner Egk. Since 1958 he was a member of the Staatsoper in Hamburg. From 1962 to 1987 he performed at the Staatsoper in Vienna (there took place in 1987 his last appearance as Ägisth in ‘’Elektra’’ by R. Strauss). 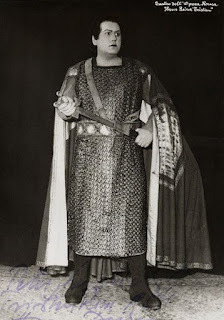 In the 1950-1951 season he appeared at La Scala as Tannhäuser and Parsifal, the next year in ‘’Die Meistersinger von Nürnberg’’ (under W. Furtwängler). He sang at this famous opera house also in 1957 as Tristan and again came back in 1967 for Tannhäuser. At the Teatro San Carlo in Naples he performed in the 1949-1950 season in ‘’Wozzeck’’by A. Berg. The role of Walther von Stolzing he sang at the City Center Opera of New York (1950). In 1955, 1957, 1958, in the 1960-1961 season and also in 1968 he guested at the Grand Opéra in Paris and performed in such a parts like Siegfried, Tannhäuser, Otello, Tristan, Erik, Florestan, Samson Siegmund and Tannhäuser. At the Teatro Comunale in Bologna he was heard in 1957 as Siegfried, at the Teatro Colón in Buenos Aires as Tristan (1963), at the Teatro San Carlo in Lisbon as Samson (1961). He also appeared as a guest in Barcelona, ​​ Lyon (1964/1965), Toulouse (Otello), Brussels (1962-1963) and London (1953). At the Teatro dell'Opera in Rome he guested in 1949 as Parsifal (opposite Maria Callas and Cesare Siepi). Guest performances also took him to the Staatsoper of Munich and Stuttgart, additionally to the Opéra de Marseille and The Royal Danish Opera Housea and also Teatro Carlo Felice in Genoa. In the 1958-1962 seasons he performed at the Bayreuth Festival as Parsifal, Tristan (1959) and Tannhäuser (1961). At the Salzburg Festival of 1951 he made guest appearances in ‘’Wozzeck’’ and ‘’Zauberflöte’’. On 23. 5. 1971 he performed at the Staatsoper in Vienna in the world premiere of the opera ‘’Der Besuch der alten Dame’’ by G. von Einem. In 1972 he sang the role of Alfred in ‘’Fledermaus’’ at the Deutsche Oper in Berlin. At this house he worked over 40 years and became its honorary member. On his 75th birthday in 1986 he sang in Berlin the role of Herod in ‘’Salome’’ by R. Strauss. He was interested in many things and also worked as writer and painter.